← Is La Marmotte 2017 on a sunday ? We have just completed our 2016 Route des Grandes Alpes point to point tour with a group from Britain. 8 days of riding starting from Thonon-les-Bains near Geneva and finishing in Menton on the south coast of France. We are pleased to confirm our 2017 Route des Grandes Alpes will commence on the 16th September 2017. The 10 day tour is limited to just 8 people in total. 17/09/2017 – Day 1 – Thonon-les-Bains to Grand Bornand via the Col de Gets (1100m) and the Col de la Colombiere (1613m). 21/09/2017 – Day 5 Briancon rest day. 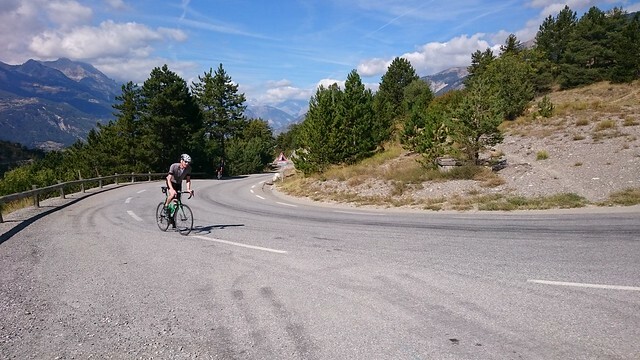 Explore Briancon or ride the Col de Montgenevre self supported. 26/09/2017 – Depart – Menton. After breakfast we will drop you off at Menton Station where you can catch a train to Nice Airport or your onward journey. A private direct transfer to Nice Airport can be arranged for an additional fee. Breakfast every day. Set dinner menu every night apart from rest day. You will need to eat out at your own expense on any rest days. This entry was posted in Bourg d'Oisans, Haute Route, Route des Grandes Alpes and tagged Cycle Tours, Haute Route, Route des Grande Alpes, Routes des Grandes Alpes. Bookmark the permalink.